Exmoor National Park in south west England has a richly diverse landscape contained within its relatively modest area of 267 square miles. You can wander across open wild heather clad moorland and explore deep secluded valleys and delightful ancient woodland. There is a spectacular coastline of high cliffs with woodland Combes plunging down to the coast and the Bristol Channel. There are a variety of attractive villages to meander through, fascinating historical sites to visit and, of course, those lovely Exmoor ponies. 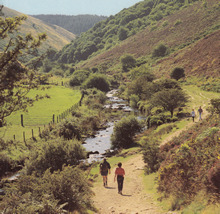 Exmoor is often compared with Dartmoor since the two National Parks are in relatively close proximity. While both are upland moorland plateaux Exmoor has a unique and very different characteristic, being smaller and having a softer benign appearance to the landscape. The moor is nonetheless dramatic and wild, especially in bad weather, but the areas of open heather moorland are small and easily accessible, so the sense of isolation when walking on Exmoor is reduced compared with Dartmoor and this makes it a less challenging place to explore on foot. Exmoor boasts over 1000km of footpaths and bridleways, through woodlands, by tumbling rivers and on open heather covered moorland. This includes a number of long distance paths passing through including the South West Coast Path National Trail. Other Trails crossing Exmoor are: Two Moors Way, Tarka Trail, Exe Valley Way, Macmillan Way West, Samaritans Way South West and Exmoor’s Greatest Walk. Circular day or short walks can be devised to explore part of all these Trails. About 12% of Exmoor National Park is woodland and the majority is situated in the east of the Park and Dunster makes a good base from which to explore this area. A delightful walk is to follow the Macmillan Way West from Dunster to Wootton Courtenay and return via Timberscombe and Vinegar Hill from where there are fine views of Dunster and the River Avill Valley which you will have been shadowing (about 13km total distance). A more complete exploration of the glorious oak woodland of Horner Wood can be made from the car park at Horner (GR SS897455). Much of this stunningly beautiful area is owned by the National Trust and with many paths in the area all you need is an OS Explorer map for an enchanting days walking. Some of the eastern woodland contains rare Whitebeams and important ancient trees such as those at Nettlecombe which can be reached on a walk from Monksilver (GR ST073374) beginning by following the Samaritans Way South West. This involves a stiff climb up Bird’s Hill at Combe Sydenham Country Park. Return via Woodford. The high moorlands dominate the heart of the Exmoor National Park landscape with their wild beauty and sense of solitude and space. About a quarter of the area of Exmoor National Park is moorland or heath landscape lying above 300 metres. Walking these heather clad moors and heathland in summer is an enthralling experience with grand vistas stretching across west Somerset and north to the Bristol Channel. Wild though this landscape is, much of its distinctive appearance is the result of millennia of human intervention by farming and the grazing of sheep, cattle and the famous Exmoor ponies. There are numerous signs of human habitation on the moors from ancient times onwards, but the forces of nature have played the dominant role in sculpting the stunning landscape we see today. Set in the heart of the moors on the banks of the River Barle, Simonsbath is well placed as a walking base. The Two Moors Way passes through the town and can be used as part of a circular route exploring some of Exmoor’s finest moorland scenery and visiting the Iron Age hill fort Cow Castle. The coastline within the National Park stretches for nearly 60 km from Combe Martin in the west to Greenaleigh Point near Minehead in the east. The stunning coastal scenery and outstanding flora and fauna resulting from a moist sheltered climate make the Exmoor Coast unique and very special. The dramatic cliffs, reaching a height of 433 metres at Culbone Hill are the highest in England and even Wales cannot beat it. Great Hangman near Combe Martin is an impressive sheer cliff of 244 metres. For 18 km from Porlock westwards as far as Woody Bay much of the coastal area is clothed in remarkable woodland including varieties of whitebeam unique to Exmoor. Much of this is pristine woodland is to be cherished and protected, but you can get to appreciate its beauty as the South West Coast Path National Trail dips into it in places such as Yearnor Wood near Culbone, Glenthorne and at Woody Bay. Walking the Exmoor coast can be a thrilling experience and provide you with very special memories to cherish. Combe Martin, Lynton and Lynmouth and Porlock are all attractive towns and good places from which to explore the coast. It is worth planning three or four days to walk the South West Coast Path from Minehead to Combe Martin. There are many lovely places to stay all along the coast making this an idyllic short holiday in summer. Lynmouth has a dramatic coastal location set in a steep sided wooded ravine cut by the confluence of the East Lyn River and West Lyn River as they cascade down the boulder strewn Combe to the sea. Lynton on the cliff top above still has an air of Victorian charm and the cliff railway which takes you from the harbour town of Lynmouth to the cliff top town of Lynton still runs today; an endorsement of Victorian engineering skill. Not far away to the west is the imposing Valley of the Rocks, a ridge of jagged shale pinnacles which can be reached on a short walk from Lynton. Not far to the east of Lynton is the beautiful Watersmeet, owned by the National Trust, where you can walk through glorious riverside woodland. Porlock is a busy village with the main A39 road running through its centre. Located about 1.5km from the sea in a lovely vale it is a useful base from which to explore the beautiful Horner Wood and surroundings. Porlock Vale cuts through the cliffs, providing one of the few low lying places along the Exmoor coastline. Its steep eastern flank is topped by Selworthy Beacon which can be reached from Allerford and rewards the walker with splendid views back to Porlock, the Vale and the coast. Head west from Porlock on the South West Coast Path and you can visit the pretty coastal village of Porlock Weir with its small harbour and attractive pub. Continue from here to climb up to Culbone through glorious coastal woodland. Dulverton is a small town nestling in the beautifully wooded Barle Valley. A wonderful linear walk following this lovely river can be made from Dulverton to Withypool, a distance of about 16km. This includes a visit to the famous Tarr Steps, an ancient packhorse bridge over the Barle. The route begins following the Exe Valley Way from Dulverton to Hawkridge from where the Two Moors Way is picked up and followed to Withypool.